Due to the way the average American loves learning about new things and taking the time to appreciate objects of cultural or historical significance, you’d think the nation’s many museums would just be sitting on piles of cash these days. Sadly, that’s not really the case, and even one of America’s most famous and crowd-pleasing museums—the Smithsonian—now needs a little bit more help than federal funding can provide. This isn’t just about regular operating costs or whatever, though, as the Smithsonian needs help raising money for one specific cause: protecting Dorothy’s ruby slippers from The Wizard Of Oz. 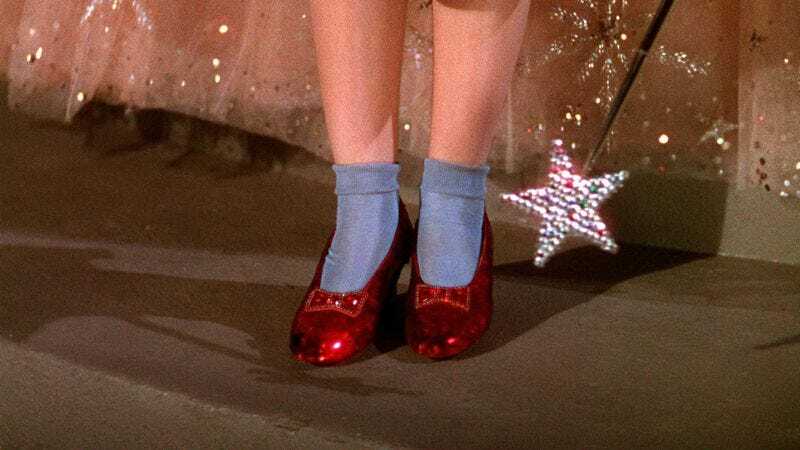 Alright, it’s not the sort of thing that mankind depends on, but the ruby slippers are an iconic part of film history. They also happen to be falling apart, due to the fact that they’re over 70 years old and were made by a costume designer simply attaching red sequins to otherwise normal shoes. The Smithsonian needs to figure out how to display the ruby slippers in the proper conditions and maintain them as best it can, both of which cost money that the Institution doesn’t really have. In order to raise money, then, it has set up a Kickstarter page and is asking people to pledge $300,000 to the preservation of the ruby slippers. The Smithsonian Kickstarter has all the usual rewards you’d expect—although “you get to wear the shoes for five minutes” sadly isn’t one of them—but this project has a major benefit that most other Kickstarters don’t. Seeing as how this money is going to a museum, any donations you pledge (minus the cost of the rewards you get) are totally tax-deductible. That means you not only get the satisfaction of knowing you helped protect a cultural artifact, you’ll also sort of get some of your money back later. It’s a brilliant scheme. If you’re looking to take advantage of this hot tax deal, you have until November 16 to back the project.